I attended a very instructive meeting of the South Gloucestershire Public Rights of Way Liaison Group (PROWLG) last week. The heart of the meeting was the question of how volunteers could and should be used to help keep footpaths clear. The general feeling was that there were a number of potential volunteers in the area, who would like to clear paths, but it was difficult to actually get a group together to do the job. One difficulty was there are three sets of people involved who need to be co-ordinated: the volunteers, the landowner and the local authority. Rennie Dickins (the South Glos PROW team leader) had recently been to a conference that produced a useful summary of the approaches used in different councils. It does not always work: this bridge was taken out by drainage contractors. (See http://www.cotswoldsaonb.org.uk/?page=cotswoldswardens ) I should imagine that the Bristol Trails group (http://www.bristoltrailsgroup.com/), which builds mountain bike trails works in a similar manner. Friends of the Community Forest Path is affiliated to BTCV and thus has insurance and would fit in with the second model. So far, most of the work done by the Friends of The Community Forest Path has followed Model 4 and has been done by one or two people. However, the group is set up to operate under Model 2, although, on the whole, this has not been the way that things have worked out. 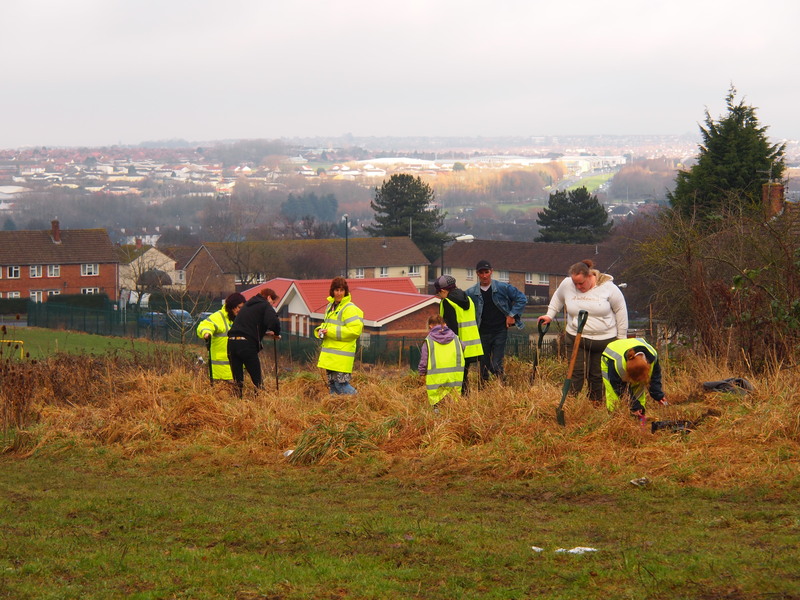 The only exception was the tree planting along footpath 306 on Dundry Slopes, which was carried out using trees obtained from BTCV, volunteers from Hartcliffe and Withywood Partnership, children from Fairfurlong School and volunteers from CSV (Community Service Volunteers.) We also had the benefit of acquiescence from the parks department. Heather Williams with residents of Hartcliffe and Withywood and children from Fairfurlong School planting some of the 100 trees received from BTCV by the Friends of the Community Forest Path. It is hoped that the trees, 20 oak, 20 beech, 20 birch, 20 rowan and 20 wild cherry will shade out the brambles that threaten to close the path from time to time. It will be some years before the trees, planted as whips, will be big enough to do this. In the meantime, they will need some TLC, which will also help to keep the path open and in the public eye. Ideally, we should do more Model 2 work, because that is the sort of work that will keep the group together. One good example of a Model 2 group similar to ours in action is provided by “A Coventry Way”, http://www.acoventryway.org.uk . Here we have a group set up to look after a circular path around a major city (40 miles long as opposed to the 45 around Bristol) with 21 circular routes off the route and a group of about 10 volunteers, which puts in kissing gates and bridges and clears scrub. The volunteer group must consist mainly of retired people, because they meet once a month on a Wednesday at 9-30 am. They are clearly prepared to work all day because it was considered worth remarking that one particular job was finished by one o’clock. The Coventry group is financed through events on “A Coventry Way”, by the sale of route descriptions of the main path but also of the 21 smaller circular routes. They also seem to make money from the sale of T-shirts and other memorabilia connected with the path. The elements of the Coventry Way set up are present in Bristol, but they need to be integrated in some way. The ideal focus would be an event. At present, most people take on the Community Forest Path as individuals or small groups trying to beat the Green Man Challenge to become Woodwoses. Giles Heeks of Moti came up with a sponsored model in which groups were led around by pacemakers as in the London Marathon. In May, a group from Oasis Academy Brightstowe (formerly Portway School) are going to do the route as a relay. The Coventry model could incorporate all these approaches. It is open to runners and walkers as individuals or as relay teams, with each category setting off individually at different times with times being recorded at check points along the route. The elapsed times are computed at the end – a little like the Cotswold Way Relay or perhaps more like the Julian House Circuit of Bath Walk (20 miles). Such an event would require checkpoints to be manned for a considerable amount of time. How could we do this? Perhaps relay teams might be able to do some of this? We should also seek help from walking groups, such as the LDWA (Long Distance Walkers Association) or the Ramblers. However, I think the way forward may lie through parishes and neighbourhood partnerships. Parish Councils in particular have close relations with landowners and many are already involved in looking after and promoting their own footpaths. Perhaps they would also support an event such as we are suggesting, especially if we promoted a charity at the same time. 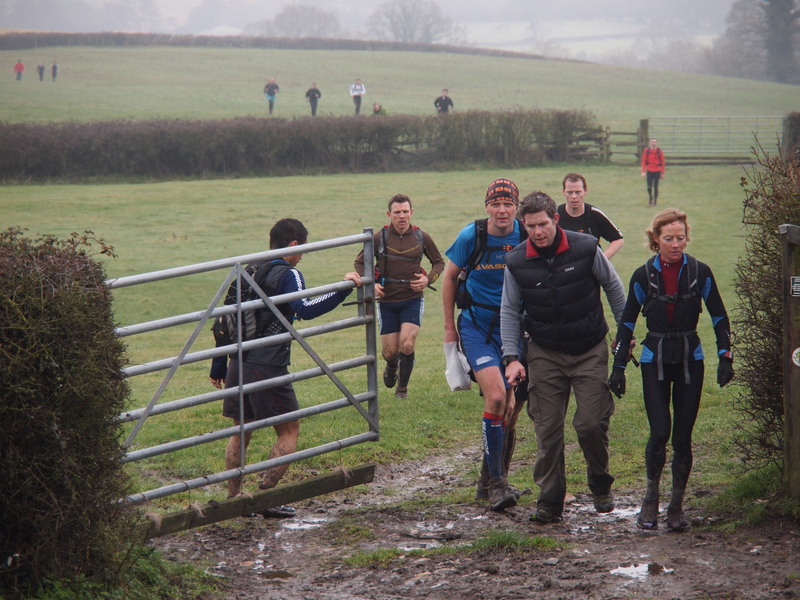 The biggest Green Man Challenge attempt so far was organised by Giles Heeks of Moti, seen here with Martin Beale and others approaching the check point on Shortwood Hill. This event was supported by Salomon and Gore sportswear manufacturers and Moti the sports shop on Whiteladies’ Road. 22 runners set off from the Green Man at 8am on 19th February. 9 brave souls finished the whole 45 miles including Angie Sadler who is the new women’s champion with a time of 9 hours 46 mins. Previously, Jonathan Gledson of TACH became the third fastest Woodwose with a time of 8 hours 12 mins on 29th January. The following week, Luke Taylor, also of TACH, produced an excellent run of 8 hours 31 mins in conditions that Jonathan said were much more difficult than when he did it. This was on 27th February. 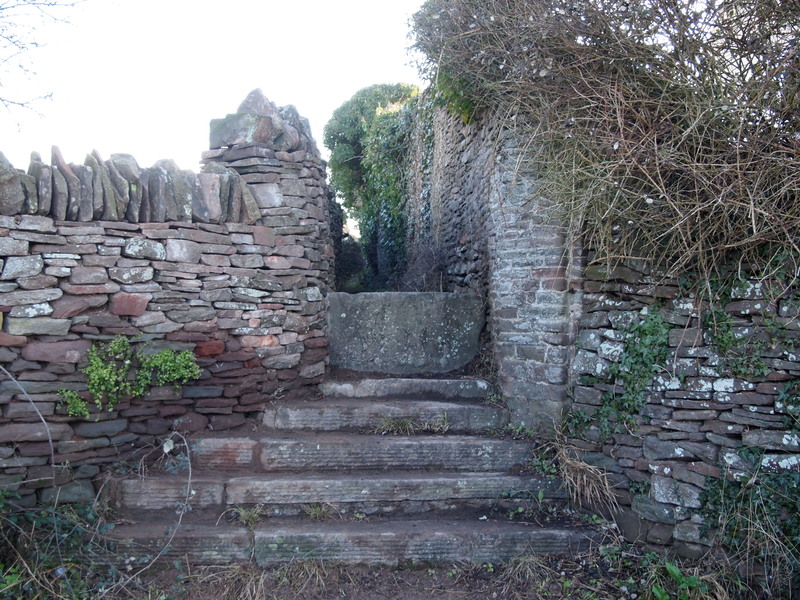 Jonathan Gledson reported that these steps were blocked by stones from the wall on the left, which had fallen across them. I went to inspect them with Giles Heeks, who is organising the Moti Green Man Challenge and the site was a dangerous mess, so I reported it to Rennie Dickins of the South Gloucestershire Public Rights of Way team. There was a bit of a problem, because the footpath is not on the definitive map. Nevertheless, the problem has been well sorted as this picture shows. There is another problem where the CFP follows the Frome Valley Walkway from the Dingle to a footbridge over the river. 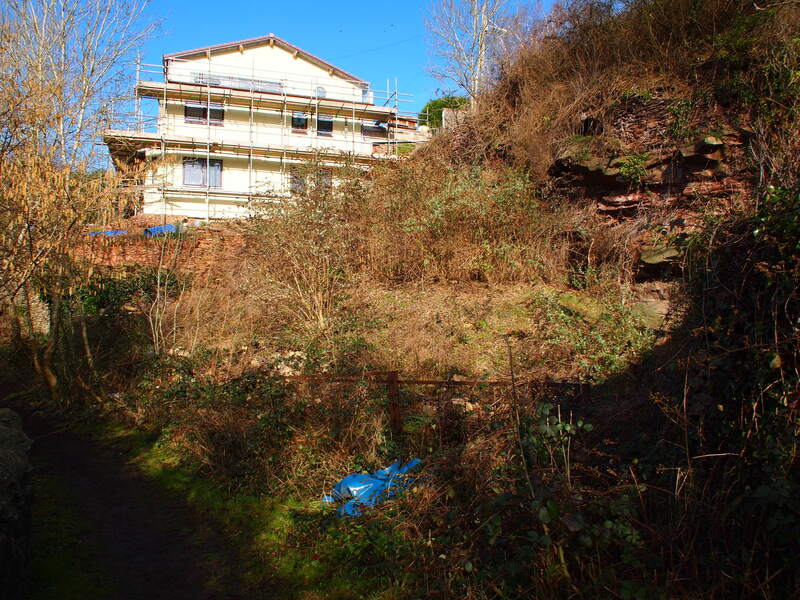 Here the path has been closed due to building up above. To avoid the problem, you have to turn left near the quarry in the picture on the left and descend to the river. This path is not without its problems, but it is possible to use it. 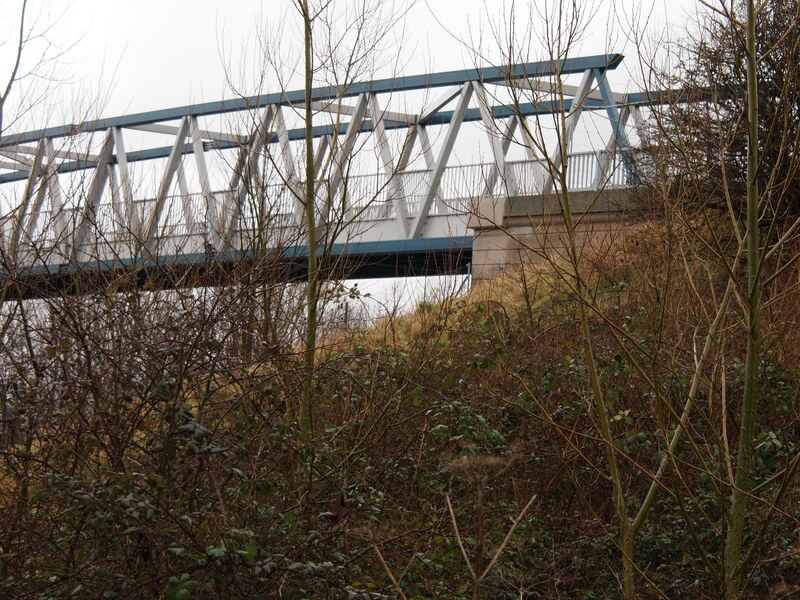 Spud Murphy, ex-Tory Councillor from Avonmouth provided an opportunity to get the Friends of the Community Forest Path into the papers when he complained about the expense of replacing a bridge over the motorway that had had to be removed because it had been damaged by collisions. Of course, by the time he complained the money had already been spent so his remarks were ineffective. But his intervention meant that I had the opportunity to reply. His response gave another opportunity for local opposition to his views to come out and I got another crack at promoting the Friends of the Community Forest Path and the Moorland Multiterrain 10K race from the Avon Riding Cente for the disabled. Now that the bridge is back in place, there is work to do on the footpaths that I mentioned in a letter to the Post. Bristol Footpath 4, which starts on the other side of the M5 is easy enough to follow if you are fit enough to jump a ditch, but two footbridges have been removed, one at either end of the path, which was diverted to enable the building of an unoccupied distribution centre. 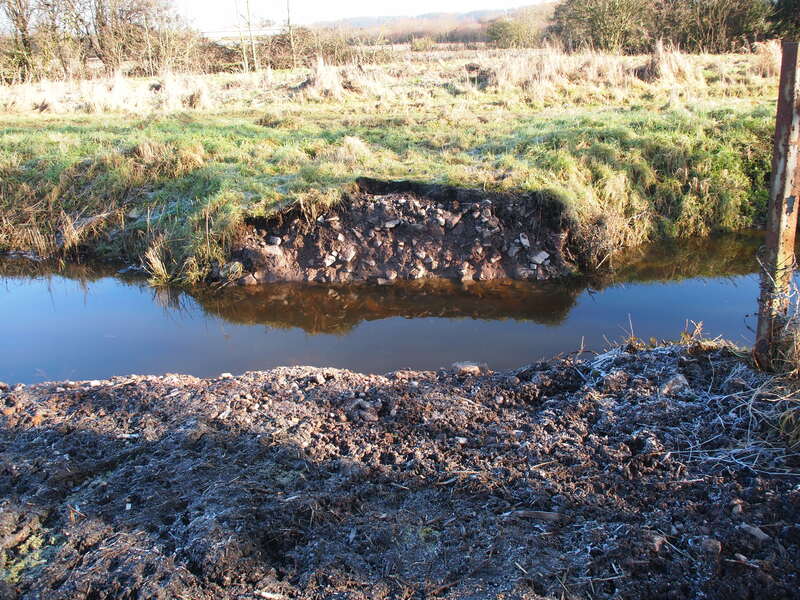 This has been attributed to carelessness on the part of drainage contractors, but I suspect it may have more to do with the perceived threat of the area being taken over by off-road motorbike enthusiasts and owners of the kind of horses that are associated with the traditional Romany gipsy way of life.